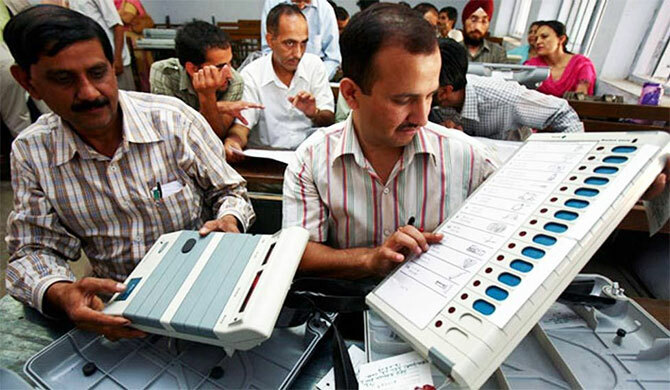 Public sector firm Bharat Electronics Limited (BEL) is looking at fresh orders for electronic voting machines (EVMs) and voter verifiable paper audit trail (VVPAT) systems to boost revenues in the current financial year, while expecting to make more deliveries for the Akash Missile system to India's armed forces. BEL, which reported a revenue of Rs 8,825 crore (Rs 88.25 billion) for the year that ended March 31, says it is confident about breaching the Rs 10,000-crore (Rs 100 billion) mark in the current financial year. The revenue growth will come despite the firm moving away from being a manufacturer to more of a system integrator, it said. An order worth Rs 1,500 crore (Rs 15 billion) for delivering a little over 800,000 VVPAT machines has been received by BEL, which the company will have to fulfil before September 2018. The firm has also won a separate order for EVMs, which will not only augment its revenues but also help boost its share of earnings from non-defence sources. "The decision of the Election Commission is that henceforth there will be 100 per cent deployment of VVPATs in all elections and hence there will be matching number of EVMs they will be procuring," said M V Gowtama, chairman and managing director at BEL. Apart from this, BEL is expecting to get an order for seven new squadrons of Akash missiles from the Indian Air Force. With the recent clearance to set up two new regiments of Akash missiles, the firm also expects to win those orders but says that might only happen by March 2018. "There is no major equipment delivery that is pending from our side. The pending order value in Akash is for completing the commissioning activities on the field. That said, we are looking at several new orders for Akash both this year and next," added Gowtama. BEL says it has allocated Rs 2,500 crore for research and development over the next three years, which might just be an incremental increase over the Rs 704 crore (Rs 7.04 billion) and Rs 777 crore (Rs 7.77 billion) it has invested over the past two years, but doesn't include the cost of developing prototypes of new projects it could win in the near future. Two projects that BEL is vying to win are the Tactical Communication System (TCS) and Battlefield Management System (BMS); for the latter it has joined forces with Rolta. "Our research and development budget of Rs 2,500 crore (Rs 25 billion) does not include what we are going to spend in TCS and BMS. If TCS comes, we need to spend a minimum of Rs 350 crore (Rs 3.5 billion), add to that another Rs 150 crore (Rs 1.5 billion) for BMS. That will be our investment in developing those prototypes," added Gowtama. For the proposed TCS, the development outlay is set at around Rs 1,000 crore (Rs 10 billion), of which 80 per cent will be reimbursed by the government. However, to sweeten the deal, BEL says it has even proposed increasing its share of the commitment, as it will be able to use the research it does elsewhere.